Lutefisk Sushi Artists Potluck this Saturday, July 31st! The participating artist potluck for Lutefisk Sushi (and little funny Series II) is this Saturday, July 31st from 1-3PM at Altered Esthetics. If you participated in either project, I hope to see you there. – You can pick up your contributor Lutefisk Sushi Volume D box at the potluck! Don’t forget to get your name checked off the list when you do. – This is the deadline to drop off your framed art to hang for the show. Please bring some, if possible. More than one item is great… too much art to fit on the walls is a much better position to be in than not enough! Note that it is not a requirement that the art you display be from your comic in the Sushi box. – Pick up promotional Lutefisk Sushi Volume D postcards to distribute. 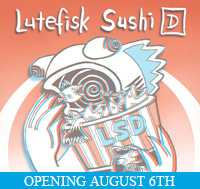 – Don’t forget to remind your friends, blog readers, co-workers, parents, cousins, casual associates, and random people on the street that the Lutefisk Sushi opening is Friday, August 6th from 7 – 10 PM! Promotional materials below. – Bring one item of food… it is a potluck! Please only participate in this discussion if you plan to participate in the show. Note that this will not be a regional show, and cartoonists from all over the world are encouraged to participate. City Pages Comix Issue :: NEW DEADLINE! I have some news! The submission deadline for the 2010 City Pages Comix Issue is now much closer than before! The publication date has bumped up, and so has your submission deadline. I apologize for the abrupt change of plans. I hope most of you can rearrange your schedules accordingly and still submit something on time. We’d like to see Minnesota well-represented in the print and web editions! While we have had a great amount of participation in the Lutefisk Sushi Volume D box, the amount of submissions for little funny Volume II has been pretty disappointing thus far. So… we are extending the deadline to July 31st. It is extremely easy and fun to participate (it really only takes a few hours to make one, especially if you just make a sketchbook out of stuff that you have lying around gathering dust). Please help make this part of the show as cool as it should be! More info on little funny and participating can be found here. San Francisco Comic Jam tomorrow night July 22, 2010! Hey all, just a reminder that the second comic jam of July is tomorrow night, July 22 2010 at the Borderland Cafe on Valencia St. 6:30 to 9/10. We will be celebrating that were not at the San Diego Comic Con by making art. The printed book will be for sale next month and the online version hopefully by next week. Three Days Left Until the Deadline for little funny Series II… which is more than you need. The deadline for participation in little funny Series II is JULY 22nd. Read more about little funny and how to participate in series II here. You can view pictures of little funny series I here. You can see what the vending machine looks like here. Got the below email from Zak Sally… pass it on. you know, when you’re putting on an event, it’s always good to send out any sort of announcement/ press release WAY in advance. MONTHS in advance, if you’re really on top of it. therefore, i’m sending this out less than a week in advance. so, last year we did a La Mano benefit show here in minneapolis, which ended up being just an astoundingly great time for everyone involved. so much so that we’re doing it AGAIN THIS YEAR!!! 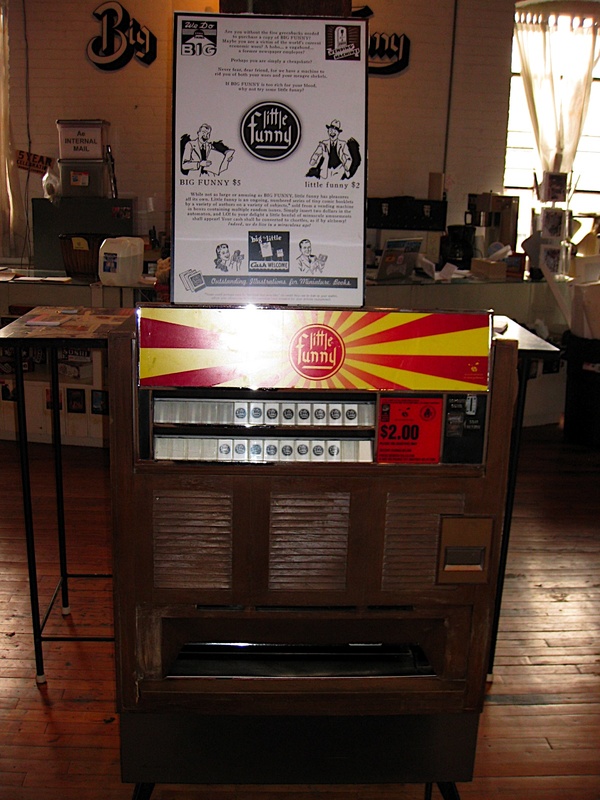 hosted at the same place: minneapolis’s (actually it’s in St. Paul) favorite all ages record store/ venue ECLIPSE RECORDS, right on university ave (1922 to be exact). same as last year, there will be zines and posters and art and weirdness set up all over the place for sale (i think more than last year), but there will also be MUSIC. (not in that order, though…). whole thing wrapped up by 11ish (at the latest). $6 door (redeemable for that amount off of most La Mano products). i know it’s crazy. it’s KIND of a benefit (because La Mano seems to be perpetually broke since the economy tanked…), but mostly it’s just an excuse to get a bunch of people together in a big room: good music, zines, art and whathaveyou. this year should be just as good. if you miss this, i don’t know what to say to you. i’ll be there. ok you all. yeh it’s a bulk email but hope it finds you well. Well, the Comic Cookbook idea thoroughly throttled its competition in the voting for a subject for next year’s art show at Altered Esthetics. So, unless someone objects in the comments here in the next few days, let’s just go with that, huh? Also, if you think of any good names and other ideas for this show, I also encourage you to put them in the comments here. Bon Appétit. My name is Jenny Sullivan and I work for the School Age Care program for ISD #197. The week of July 26th I will be teaching a comic book making class for the School Age Care summer program. I am contacting you to see if you may know of any local cartoonist that would be willing to volunteer their time to come speak to my students about their careers? 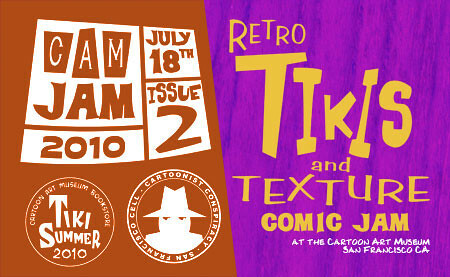 REMINDER: The second Cam-Jam comic jam of 2010 will be this Sunday July 18, 2010 a the Cartoon Art Museum. This is an event I am organizing, so of course I will be there and I hope you will be there too.